27 July 2017. 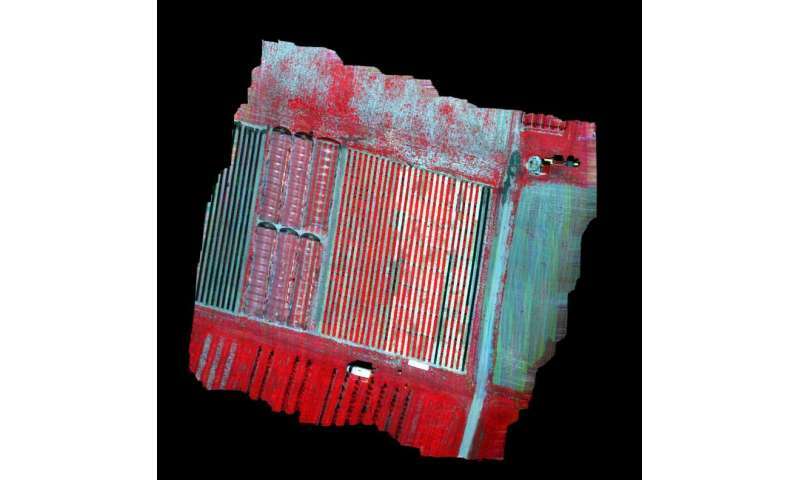 Precision farming is set to become even more precise with a new camera drawing on satellite imaging. Thanks to research with ESA on new cameras, hyperspectral cameras flying on drones are now able to see details as small as 4–5 cm. Three customers are already using the first version of the ButterflEYE LS camera: in Denmark for biological diversity studies, in Australia for agricultural research, and in Italy for providing commercial data to farmers. The experiences will be fed back into the final commercial version. “Our first customers were really keen on getting the high resolution, which is the best you can currently get from a hyperspectral product,” notes René Michels, CEO of Germany’s airborne specialist Cubert, who collaborated with Belgium’s VITO Remote Sensing and imec for the camera development. The camera exploits the potential of a novel hyperspectral imaging chip from imec by combining it with VITO’s image processing honed by working with ESA on remote sensing satellites. Weighing just 400g, the powerful camera fits easily on a small unmanned aircraft to deliver detailed measurements for precision agriculture but it has also potential in forestry, biomass monitoring, waste and pollution management. Historically, a prism has been used to separate the colours but this results in complex optics and larger cameras. Following VITO’s work on the Proba-V satellite, ESA’s Luca Maresi set the company a challenge of producing a lightweight hyperspectral camera based on a different technology. The initial approach uses a variable filter in front of the detector, creating an instrument as compact as a standard colour camera and therefore suitable for use on small satellites and drones. One is used by Dutch Cosine Research in their HyperScout camera for the GomX-4B CubeSat, to be launched this year. To make the camera even more versatile and suitable for mass production, imec created an ultra-small sensor with the hyperspectral filter incorporated. Cubert used this filter-in-chip sensor in their new ButterflEYE LS camera. 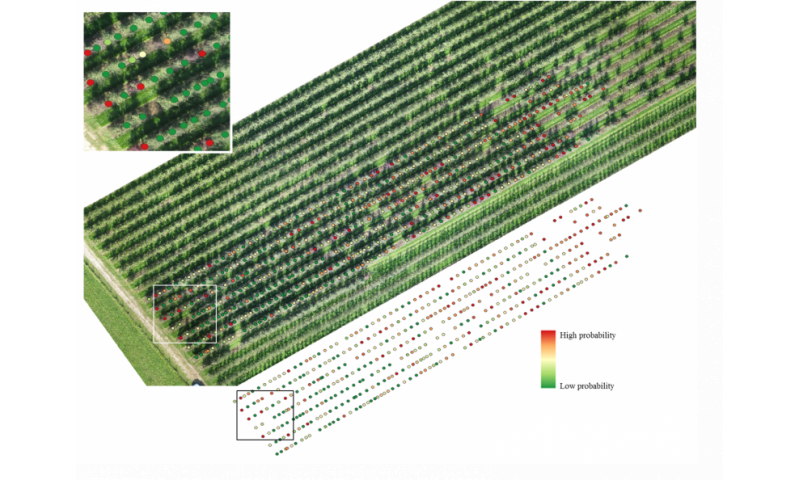 Hyperspectral cameras produce huge amounts of data that have to be downloaded to VITO’s cloud computing environment to be processed to produce the required information, including action maps to help the customer. “You need to know where in the colour spectrum to look in order to identify the changes you are seeking and derive the required information,” explains Bavo. “Many people fly drones and think they can now do Earth observation, but it’s much more complicated than that,” points out Sam Waes from Belgian company Verhaert, part of ESA’s technology transfer programme network. The next step is to add standalone processing, which VITO and Cubert hope to do by the time the ButterflEYE LS moves to a fully commercial offering in 2018. Then the users can do the processing themselves, instead of now with the support from VITO. A consortium involving VITO has already been working with ESA to optimise the software for satellites, with the result that the HyperScout instrument now has its own onboard processing. “This is a big revolution in the way we operate satellites. Now we have a very tiny system that can deliver realtime information ready to use, for example on forest fires or natural disasters,” explains Luca Maresi. Other planned developments include a much more sensitive chip – 12 megapixels instead of the current 2 megapixels – which is now being developed under an ESA contract by a VITO-led consortium.